In spite of having innovation of material cost with 82.4% of total cost, the manufacturers in Vietnam tended to focus on the competitiveness for reduction of producing cost which has only taken 17.6% of total cost. For starting up trades of starch products, NTD Starch realized the key factor of trading this product line is to guarantee the source of raw material with low price. Thus, NTD Starch has invested to operate PDA cassava farm which is the biggest one of cassava plantation in Southeast Asia located at Kratie province, Cambodia with the sustainable capacity of self-supply of cassava material. NTD Agriculture is functioned to purchase the large amount of cassava material from 05 provinces of Northeast Cambodia (Kratie, Mondolkiri, Rantanakiri, Stung Treng, Kampong Cham). The material in these above provinces supplied with the lowest price and this is considered to be an advantage for cultivation y of self-supply of cassava material. Through innovation, NTD Starch Co., Ltd has developed to be the sole enterprise for producing and exporting starch (native & modified starch products) following the model of “Vertical Integration”. Vertical Integration is considered as the method of management that brings the large market share of the supply chain for not only general ownership, but also the enterprise. Strengthen through the model of Vertical integration entirely helps NTD Starch enable to manage throughout production procedures. 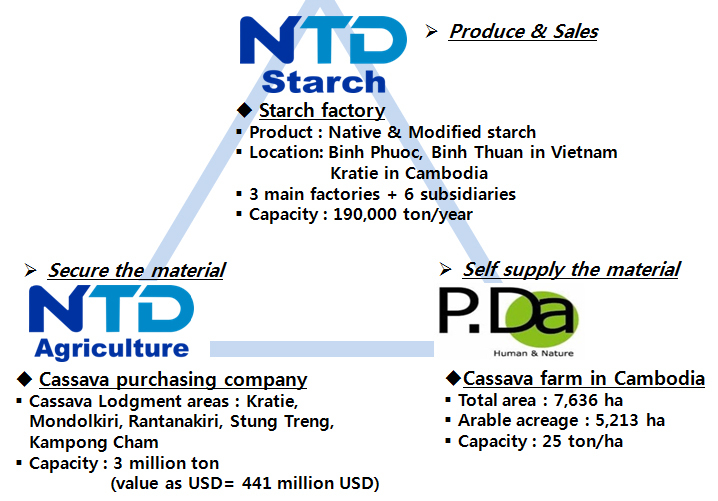 NTD Starch currently owns 03 main factories and 06 subsidiaries located at provinces of Binh Phuoc and Binh Thuan, Vietnam and Kratie province, Cambodia where sources of input raw material supplied with the low price which help NTD Starch enable to become a long-time supplier meeting all needs of customer with the supplying quantities are over 190,000 MT/year. NTD Starch is advancing forward to carry out the following innovations relating to manufacturing procedures, global sales activities, logistics and creating high value-added with a view of becoming the global No 1 company in tapioca starch industry.